Google unveiled the Android One smartphones in India. In its first launch they are launching 3 smartphones from different partners. Sundar Pichai, Senior Vice President for Android, Chrome and Apps of Google announced in the Google I/O developer event earlier this year that the Android One project is to bring a rich Android experience with low cost smartphones. Android One is a project introduced by Google to provide rich Android experience with low cost smartphones. Google will push the Android updates as and when they come instead of the OEMs. The Android One devices will be automatically updated. The box of an Android One device says 'Always the latest version of Android'. The Android One devices will include support for seven additional languages including Hindi and users will not have to download any external application to access their Android One smartphones in Hindi. The smartphone partners that Google has involved with for the first series of devices in India are Micromax, Karbonn, and Spice. 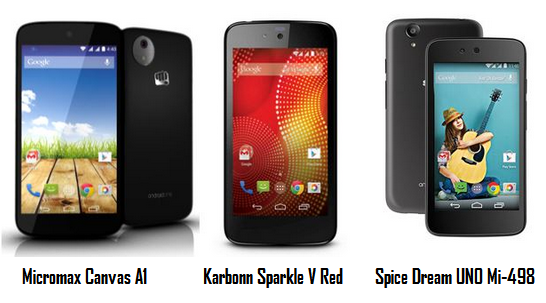 these are the 3 OEMs who has come up with the latest Android One devices in the market on budget segment. The average specification of the above mentioned smartphones are similar or can say almost same. Here are the highlights. The Android One smartphones will be exclusively sold via online retailers immediately. The three leading online retailers are Amazon, Snapdeal and Flipkart. Since the devices are pretty much the same, you could also make a decision based on your preference for a particular online store. Google plans to expand Android One to Indonesia, Philippines, and other South Asian countries by the end of 2014. Other countries will be followed up after the second phase and mostly in 2015. Google also announced the next set of partners for the Android One second phase and they are Qualcomm, and OEMs like Acer, Alcatel Onetouch, HTC, Lenovo, Panasonic, XOLO, Lava, Intex, and Asus. Samsung and LG are excluded from the list. Check the below video on Android One. Lets see how the newly launched smartphones from Google's initiative make people crazy with fully loaded Android features with low cost phones.